Kodak introduced two new additions to its award-winning line of Kodak Easyshare Consumer Digital Cameras at the 2007 International Consumer Electronics Show (CES). 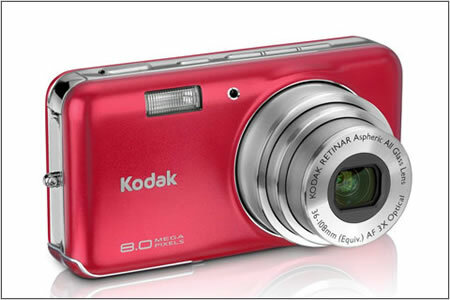 The Kodak Easyshare V1003 Zoom Digital Camera – with 10-megapixel resolution and the Kodak Easyshare V803 Zoom Digital Camera – with 8-megapixel resolution, have 3X Kodak Retinar Aspheric All Glass Optical Zoom Lenses, and come in multiple signature color choices with fun accessories to match your personal style. The Kodak Easyshare cameras features a new menu feature called “Maintain Settings” stores your preferred settings for flash, white balance, ISO and resolution between uses, saving you time and assuring you have the camera set up your own personal way. 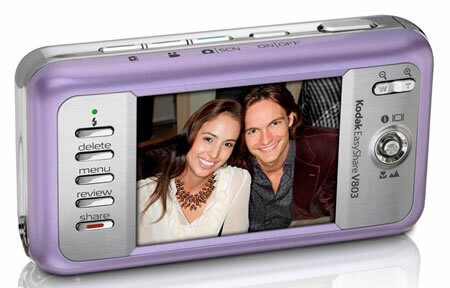 The Kodak Easyshare V1003 and V803 Cameras produce vibrant shots with dynamic picture quality that can be viewed on the large 2.5-inch (6.4 cm) color LCD screen. The cameras are packed with smart features that make great picture taking incredibly simple, including: Digital image stabilization using the anti-blur mode to prevent blurring from subject or hand movement, Advanced video mode to record VGA video (640 x 480) with sound at 30 fps; includes trimming and tagging for easy editing and searching and 22 scene modes, including simple on-camera stitching for dynamic panorama shots. Both the cameras measure 103 × 54.5 × 25 mm and weigh approximately 141.5 g. The Kodak Easyshare V1003 Camera will retail for US $249.95 beginning in March, and the V803 Camera will retail for US $199.95 beginning in February.